Hurricane Harbor Phoenix will feature 30 slides, rides and attractions including North America's first gravity-defying dueling water coaster, the park says. PHOENIX — Arizona's largest water park is getting a new look and new name before it's 2019 season. According to a news release, Wet 'n' Wild in Glendale will open March 16 as Six Flags Hurricane Harbor Phoenix. The amusement park company bought the 35-acre park in May of last year. The rebrand includes updates to the park's themes and attractions. 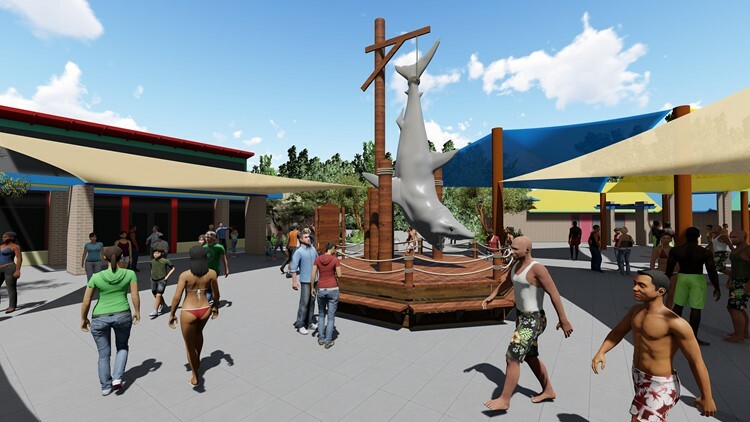 The Caribbean-inspired Hurricane Harbor will feature 30 slides, rides and attractions including what park officials say is North America’s first "gravity-defying dueling water coaster." The ride blasts riders uphill across 830 feet of drops and curves, according to the news release. Memberships and season passes are on sale now for free unlimited visits to Six Flags Hurricane Harbor Phoenix, Six Flags Magic Mountain and all Six Flags theme parks across the country. Members and season pass holders will also be invited to take a sneak peek of the new park on March 9 and 10. Spring break will kick off Hurricane Harbor's season on March 16-24. After that, the park will be open on weekends in March, April and May. The park will be open daily during the summer starting May 18. Hurricane Harbor Phoenix is located on Pinnacle Peak Road near Interstate 17.